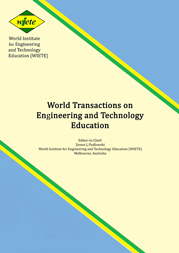 In 2002, an international journal called the World Transactions on Engineering and Technology Education (WTE&TE) was established at the then UNESCO International Centre for Engineering Education (UICEE), which was based at Monash University in Melbourne, Australia. With the closure of the UICEE in December 2008 and the transfer of intellectual property and copyright on to its founding Editor-in-Chief and the former UICEE Director, the publication of this highly successful journal was resumed in 2009 under the auspices of the World Institute for Engineering and Technology Education (WIETE). The WTE&TE has been included in the list of journals generated by the Australian Research Council (ARC) under the Excellence in Research for Australia (ERA) initiative. The paramount objective of this initiative is to launch a journal ranking list on a discipline-specific basis to evaluate research excellence and research impact. The WTE&TE is included in the Scopus Journal Citation Index, one of the products of Elsevier, the world's leading multinational publisher of science and health information. This represents a further step forward in our persistent endeavour to make the Journal available to a wider global community of engineering and technology educators.